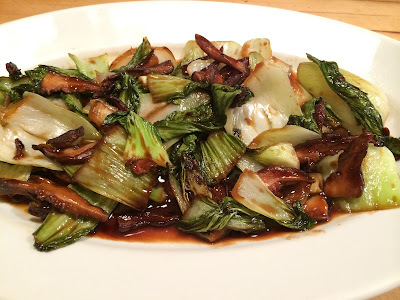 After the holidays the only food I want to think about is clean, healthy, and easy to prepare, and this bok choy fits the bill on all three. Start by sautéing a half dozen sliced shitakes with a little bit of oil in a large pan or wok over high heat for five minutes. Clean and chop the bok choy, at least one head per person, then add to the pan and sauté for another few minutes. Turn down the heat to medium low, add two chopped garlic cloves and two tablespoons of soy sauce and leave on the heat for another few minutes or until the stalks are tender. When you’re ready to go simply stir in four tablespoons of oyster sauce and serve. If you’ve had an especially festive holiday season and the thought of making this bok choy overwhelms you I would suggest defrosting a box of frozen peas and tossing them with olive oil, salt, and vinegar. Cheers!